Hundreds of kindergarten teachers and caretakers for schoolkids assembled outside the historically important Friedrichstrasse train station this morning, in order to rally for an increase of their salaries and improved labor conditions. The protest took place during the first warning strike the union GEW organized even though the first round of negotiations with the state employers only just commenced. Both the Berlin U-Bahn (Berlin’s underground, subway or metro) and S-Bahn (fast city train) were full of nursery school teachers and other caretakers before 9:00 a.m.. Many were holding signs with demands, virtually all of them wore orange vests with the GEW logo. One of them, a young lady responsible for afternoon activities at a primary school in Berlin said she and her caretaker colleagues would never be paid like teachers. “We will never get the same salaries, not in this life, and not in the next”, she said. While both primary school and high school teachers have monthly gross salaries of 5400 Euro (6178 U.S. Dollars or 4695 GBP), the amount their colleagues in the poorest E.U. country Bulgaria earn in a year, nursery school teachers in Berlin get less than half. And they are 300 Euro (343 U.S. Dollars or 261 GBP) behind their colleagues in the neighboring Brandenburg province. At the protest, Christiane Weisser of the GEW union told The Berlin Spectator, especially in Berlin it was important to raise salaries for kindergartners, because the German capital was hopelessly behind compared to other provinces. In addition, there was a shortage of skilled labor in this field. The profession needed to become more attractive. “We notice that many positions are vacant. This aspect has ramifications for our work”, Christiane Weisser stressed. Siebernik represents some 14,000 nursery school teachers and caretakers in Berlin, as well as employees at the youth welfare offices. But, all in all, the negotiations are about salaries and labor conditions for one million people. The 276 state-owned kindergartens in Berlin and some other institutions were affected by the strike. While many of them were closed until noon on Tuesday, others offered a skeleton service with only a few teachers. According to participants at the protest, most parents showed sympathy for their struggle. In cases likes this one, parents of kindergarten kids in Berlin usually help each other by organizing activities with kids themselves. Some parents needed to stay at home today, others took their children to work. 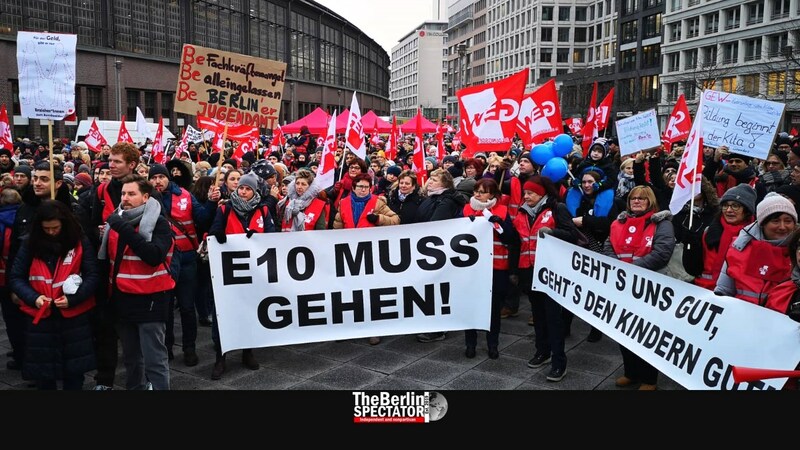 Today’s warning strike was supposed to raise awareness among Berliners. The GEW says the educators in nursery schools “should not be forgotten”, also because their tasks had become more complex. Indeed, kindergartners do far more than just feeding little kids or playing a few games with them. They do have an educational mandate. On top of that they work on inclusion and integration. And they need to write reports about the developmental state of every single child they care for. For Berlin’s governing coalition consisting of Social Democrats (SPD), leftists (‘Die Linke‘) and Greens, Treasury Senator Matthias Kollatz is the one sitting on the other side of the negotiating table. Generally speaking, the Berlin Senate does not ignore social aspects. For instance, it recently scrapped all kindergarten fees, meaning parents whose kids are in nursery schools run by the state do not pay a single dime, as opposed to parents in other German cities or regions. Still, the state employers will not give everything away during the first round of talks. Also they will not agree to all demands. A salary increase of 6 percent or at least 200 Euro, which is what the GEW wants, is expensive.